True Thai Massage is a melting pot of METTA (loving kindness), VIPASSANA(meditation of insight), MASSAGE and YOGA. It is a tool which enables us to reach into emptiness and find fullness of touch and presence…In a state of detachment and equanimity, we are able, with our touch, to offer the other person the opportunity to recall the message from the inside of them where they touch their deepest suffering and can set themselves free. This kind of exchange existed before any labels and traditions were ever created…it came from beings of light – from one to the other…in the simple gesture of touch, of exchange. Nowadays, living in Babylon, we need this jewel and the existence of this “tradition” in order to reclaim that which we all once knew. Thai Yoga Massage is a Sacred Dance. It is a holy communion between two people used to unblock energy stagnation. It is essentially an ancient Eastern healing technique used as a tool to awaken our spiritual flame and inner therapist. Learning the beautiful art of traditional Thai massage is not just about memorizing a series of exercises, nor about thinking that we can cure someone of their sickness. It is about learning to give from the heart with compassion and to have a deep understanding of the other person’s suffering. We are reflections of each other’s strengths and weaknesses. In this 12-day retreat course, we offer a life-changing experience for many, as we have seen over the years. We are teaching the basic Thai Massage technique with 7 hours of daily theory, demonstration and practice. We are also teaching yoga, chi gong and meditation to bring awareness and flexibility into the massage. Through this, we are guiding people to believe that they can touch others, that they can be touched and that they have inside of them the potential to help others heal. We go on an intense spiritual journey of self-discovery during this course, which enables us to see in others that which we see in ourselves and thus helps us to overcome difficulties and face the obstacles which are in our paths in our daily lives. Our teaching is inspired by the Dhamma and instruction of two Thai massage masters Chayuth and Pichet of Northern Thailand, as well as the teachings of Asokananda. Our main focus on this course is to heal ourselves on the path to helping others heal. We call on a variety of techniques (Yogic, Taoist, Sufi) to help connect to our deeper, higher selves in order to ignite the spiritual healing flame. We also focus on the nutritional aspect of food, which can be the simplest of ways to nurture us on a daily basis. The course offers practical training on the Art of Traditional Thai Yoga Massage. Our courses usually have many assistants, both Greek and from other countries, who bring colors and diversity to the practice, some of whom are fellow teachers of the Sunshine Network. They also offer full body Thai massages during the breaks for those who wish to receive. 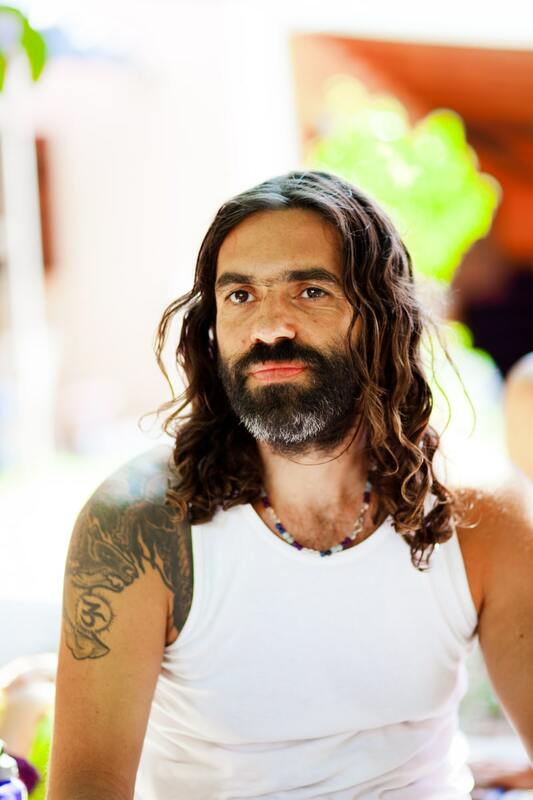 His base is at Sunshine House, where he leads a variety of retreats aimed at igniting the spiritual, healing flame that lies dormant in each and every one of us, however, he still spends time traveling abroad to teach and also study, where possible. He is renown for his unique, fun-loving and passionate way of teaching as well as his generous spirit, hot hands and delicious home-made recipes. When he is not teaching, he is with his three beautiful children or soaking in hot spring waters. Upon completion of the course, a certificate of attendance from the International Society of Thai Yoga Massage (Sunshine Network) is awarded.